For most people, PowerPoint is boring. When you need to make a presentation, it’s the most basic and obvious choice. Unless you have some design chops and/or a lot of time, a ‘beautiful PowerPoint presentation’ is often something of an oxymoron. But that could start changing. Microsoft is introducing two tools today called Designer and Morph that strive to make your PowerPoint slides look like they were created by a pro designer, as well as enable smooth graphic transitions that simply weren’t possible before. First up, Designer uses cloud-based machine learning to help you create professional-looking slides in seconds. It works like this: drop an image or two into your slide, PowerPoint sends the graphics to the cloud, and then provides you with several different templates it thinks best suits the image. These are based off of over 12,000 blueprints created by actual designers. Microsoft demo’d the tool, and even within pre-set scenarios, I was impressed at how well the app was able to distinguish between different types of images. For example, if you have a generic-looking stock photo, it knows that you might want to use that photo as a background, and that it’s okay to crop out some parts or apply an overlay. On the other hand, when your graphic has a clear focal point, it will do its best to not crop out the subject, or provide templates that highlight the subject. It’s not just photos either; Designer knows that if you’ve inserted a graph or chart (or even a photo of a graph), you aren’t going to want to crop out any information. It’s very clever, and gives you enough options to choose from. To be clear, everything Designer does is possible to do within PowerPoint manually. It just does it really, really fast. Perhaps more importantly, it allows for some design options the average user may have never thought of, or even known were possible. And once you apply a Designer template, you’re free to modify things to your liking. Because it’s a cloud-based system, Microsoft says Designer will only get better with time, and Microsoft will be expanding the tool with more slide types. Then you have Morph, which is basically Transitions on steroids, and allows for full-fledged animations you simply couldn’t do in PowerPoint before. It’s really simple: duplicate a slide, move or modify the objects within the duplicate, and click Morph. PowerPoint will then automatically apply transitions to each of the objects. You can resize a chart, move text, insert objects, etc. It works with both 2D and 3D objects, and can even recognize when you’ve changed a shape too – such as turned a square into a rectangle – and then shape-shift the object seamlessly. It’s basically a way to animate with keyframes within PowerPoint. Microsoft says these tools were motivated by the fact most people can recognize a professional looking design, but they don’t know how to make one themselves (or can’t be bothered to put in the time). With Design and Morph, working on PowerPoint might actually be a bit more fun. 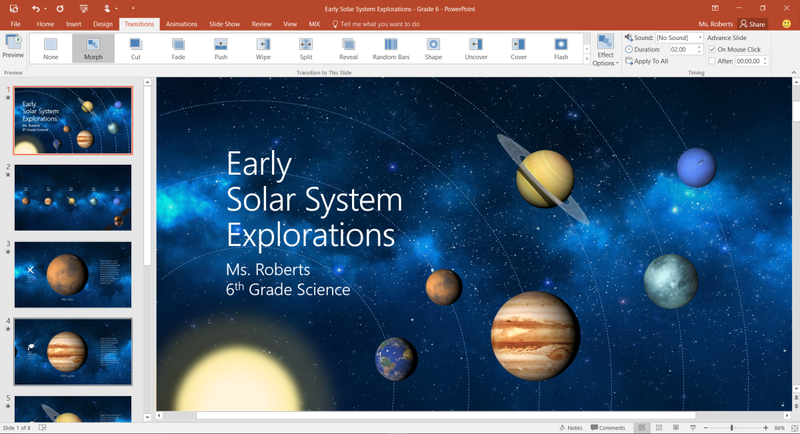 One last tidbit, if you want to get the head start on the latest Office features, Microsoft is starting an Insider program for Office users. As with the Windows version, it lets testers access pre-release tools and updates. These builds should be pretty stable, but insiders can provide feedback to help improve features before a wider rollout. Both Design and Morph are rolling out this month for Office 365 subscribers. They’ll only be accessible on Windows desktop and mobile to start, but Microsoft says they’ll come to other platforms soon.